By early September 2010, torrential monsoon rains had not only pushed the Indus River over its banks, but also raised water levels in a nearby lake. The Advanced Spaceborne Thermal Emission and Reflection Radiometer (ASTER) on NASA’s Terra satellite captured this image of the two water bodies on September 5, 2010. In this false-color image, vegetation is red, and bare ground and settled areas vary in color from gray to beige. Water ranges in color from navy blue to teal. The greenish hue of the Indus River likely results from the flooded river’s heavy sediment load. 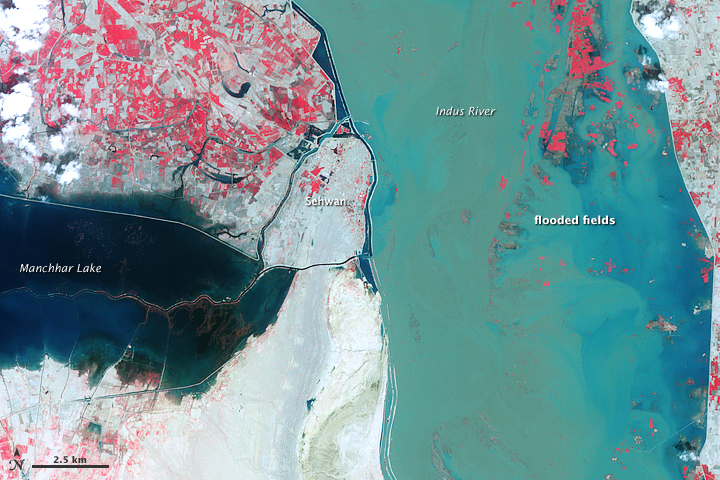 Patches of red in the river hint at the scale of flooding; these areas are farmland submerged by the swollen Indus. A network of canals connects the Indus to the nearby lake, which also appears flooded. Manchhar Lake (also spelled Manchar Lake) is Pakistan’s largest natural freshwater lake. Located immediately west of the city of Sehwan in the southern Pakistan province of Sindh, Manchhar Lake receives not only rainwater from a vast catchment area in western Sindh, but also fresh river water through the canals. Drainage water also feeds into Manchhar Lake through the Main Nara Valley Drain (not shown), which connects Manchhar to Hamal, another lake to the north. Following a dam failure in August, the Indus River essentially split in two, sending some water downstream on the Indus, and some water over vast stretches of agricultural land west of the river. By early September, the floodwaters west of the Indus had formed a twin river that terminated in Manchhar Lake. As of early September 2010, the United Nations Office for the Coordination of Humanitarian Affairs reported that millions of Pakistanis were living without basic necessities, their homes and livelihoods destroyed. Waterborne diseases were spreading, and authorities worried about an outbreak of malaria. In Sindh Province alone, more than 27,000 square kilometers (10,500 square miles) remained submerged. 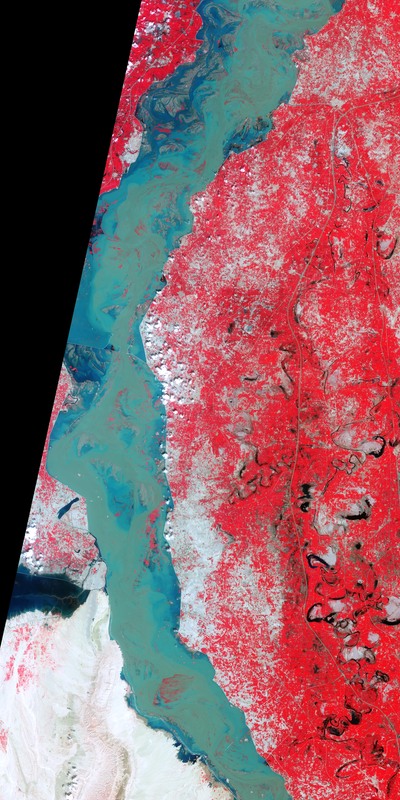 Acquired September 5, 2010, this false-color image shows the Indus River and nearby Manchhar Lake, both swollen by floods. Mastoi, G.M., Shah, S.G.S., Khuhawar, M.Y. (2008). Assessment of water quality of Manchar Lake in Sindh (Pakistan). Environmental Monitoring and Assessment, 141, 287–296. United Nations Office for the Coordination of Humanitarian Affairs. (2010, September 8). Pakistan: Emergency not over, UN humanitarian chief warns. ReliefWeb. Accessed September 9, 2010.